Using modern arboricultural techniques and an up to date range of arboricultural plant and machinery we offered a safe, efficient and qualified tree surgery service. We listened carefully to our customers and offered practical and safe solutions based on our extensive experience, learning and knowledge from years working within the tree industry. A tree will attempt to fill any gaps in its canopy with branches and leaves, (they are phototrophic - light-loving - growing towards the light). They also develop in balance with their surroundings according to the space available, the soil they grow on, the weather conditions, available water and so on. A tree is a woody plant that has Trees are plants that have evolved a strategy using woody tissue to grow upwrads to capture as much sunlight as possible. The sunlight is captured by the leaves and is converted into to sugars which the tree stores throughout its structure, but mainly in the roots. This primary goal, to stop as much sunlight as possible, can sometimes be in direct conflict with humans who use the land which surrounds them. By their very nature they cast shade and drop leaves, branches extend out in search of light. Experienced and knowledgeable tree surgeons can help to alleviate such conflict and help to increase the safety of the people and property which surrounds them. Different species of tree react in different ways to pruning. Our knowledge built up from years of climbing and pruning trees means that we can advise customers correctly in order to avoid future problems and importantly not to actually create future problems. 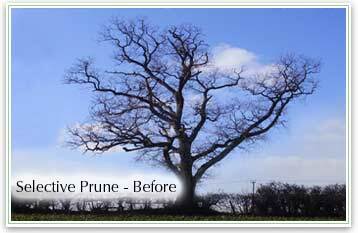 The correct way to prune a tree, or the decision to completely remove a tree has to be based upon a whole range of factors; the species of the tree, its position, absence or presence of disease, the surrounding trees, previous tree surgery, time of year and of course, importantly, what you the customer are looking for in the short and long-term. On occasion, bad, heavy-handed tree surgery on some species can lead to thicker, denser regrowth creating more shade & more leaves which is the one thing that many customers do not want. Despite our name and philosophy we are not adverse to felling trees or adverse to their complete removal where nescessary. We recognise that in urban environments or alongside roads and footpaths trees have a lifetime. In an urban setting trees have a use, a function, a role. When they become too large, diseased or dangerous then they must be removed safely and efficiently. Our range extends out from ...for approximately 20 miles. 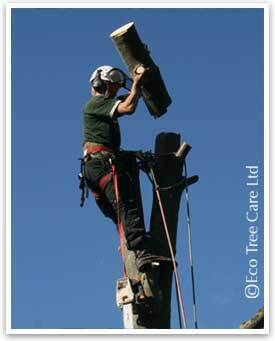 Tree surgery is just one discipline that is part of the wider subject of arboriculture. 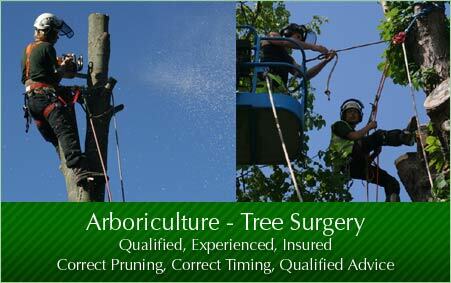 Arboriculture means the care of trees. 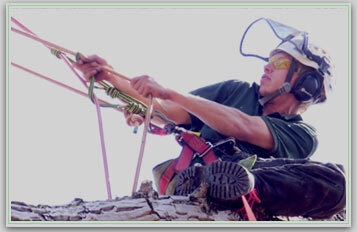 An arborist is someone who is competent and qualfied to carry out tree surgery. 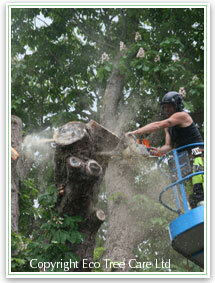 Tree Surgery is the pruning & shaping of trees to maintain them with regards to their position. It is an attempt to keep them healthy, safe and to extend their lifetime. Importantly it is also to maintain and perhaps even increase their asthetics so they continue to be assets to their owners and to all that can see them. Tree Surgery may involve climbing the tree using a rope and harness or accessing the tree using a Mobile Elevated Work Platform (MEWP). Often it involves the use of chainsaws, but on smaller trees hand saws and loppers may be used. All equipment used as part of the climbing equipment must comply with LOLER 1998 - Lifting Operations and Lifting Equipment Regulations. 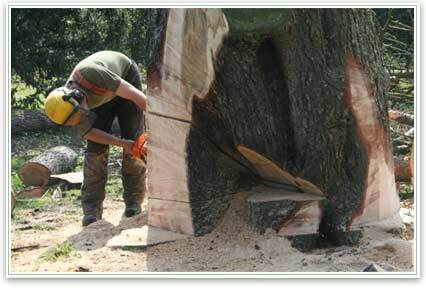 In general terms tree surgery is the knowledge of where, when and how to make a cut into a tree. But importantly a good tree surgeon will be someone who will understand the tree as a living organism and will know when to leave the tree well alone or, conversely, and to the other extreme, when the tree may be unsafe or unsuitable for its position and require complete removal. Tree surgery is a professional vocation. There are nationally recognised qualifications for arborists and there are minimum qualifications to legally work with chainsaws and to legally climb, fell and prune trees. However there are problems associated with this tree surgery operation. 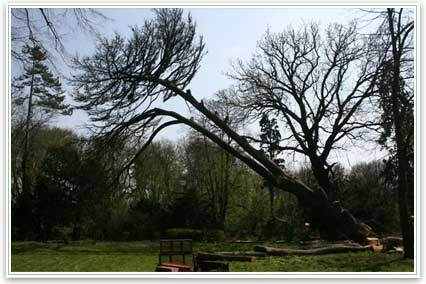 For large and mature trees this should only be considered as a last resort, and then only by arborists with a considerable experience in tree work. Poor workmanship and heavy handed reductions can be counter-productive long-term and result in future problems and/or set the tree into a spiral of terminal decline. 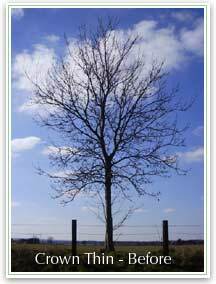 Different species of trees will tolerate and respond to an overall reduction in different ways. 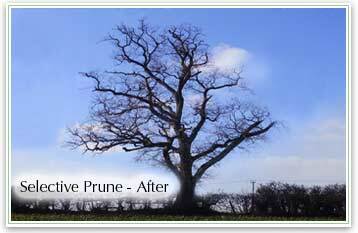 For some species the new branches that form as a response to pruning are inherently weak and prone to decay. It may be that due to the age, health and species of the tree and its location that a crown reduction is not appropriate. If some action is unavoidable due to the requirments of its position then preference should perhaps be given to complete removal and replacement of the tree. 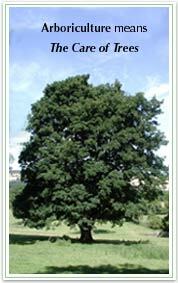 Again this decision should only be made by an experienced arborist considering all the facts. 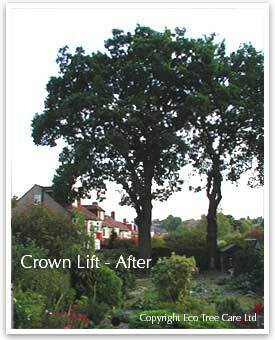 See the Crown Reduction web page for an extended discussion on how and when crown reductions should be carried out, the problems associated with them when the wrong decisions have been made and the future results of poor tree surgery. The percentage of the leaf-bearing branches that are removed in a crown thin should be specified as a percentage of the total. As a general rule no more than 25-30% should be removed in one growing season. 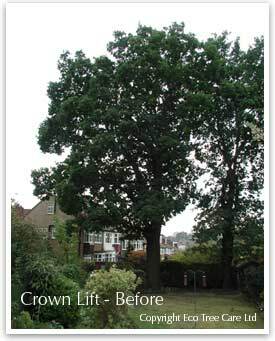 A good tree surgeon will also remove any dead, dying, crossing or otherwise defective branches during a crown thinning operation. Like a crown reduction there are problems associated with this tree surgery operation. Over-thinning of some species can result in copious re-growth resulting in a denser crown in a short period of time. 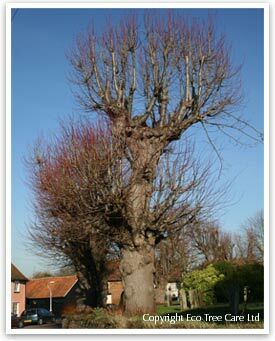 Some species, such as lime and sycamore, that have been over-thinned or over-reduced will even respond, not only with more densely growing branches, but also with leaves that will be of a larger size. 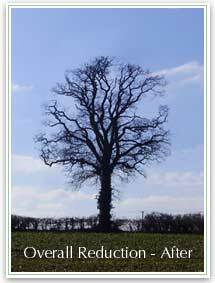 See the Crown Thinning web page for an extended discussion on how and when crown reductions should be carried out, the problems associated with them when the wrong decisions have been made and the future results of poor tree surgery. When large branches are cut back to the main stem the resulting wound can weaken the structure and increase the probablility of stem failure. This is especially true when the branch size is comparable in size to the stem size, or when more than one large branch is removed from the same area, particularly if at the same level; on the opposite side of the stem for example. 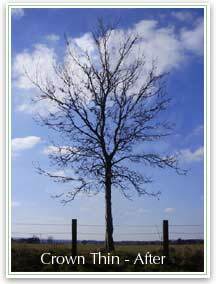 If the tree is mature or old then it is less likely to respond well to the wounding. The tree will be unable to close over the wound and the result long term can be a seat of extensive decay. Deadwood removal is a tree surgery operation where, as the name suggests, branches that have died or are dying are removed. Often the deadwood is removed back to the nearest live wood, and often to the point where the tree has naturally seperated itself from the deadwood. Where space allows and where there are no obstacles or targets a tree may be felled in one go. A directional cut is made at the base of the trunk and the tree allowed to fall. Where necessary or simply as a failsafe, a pulling rope of directional winch may be used to encourage the tree to fall in the intended direction, particularly for large heavy trees. 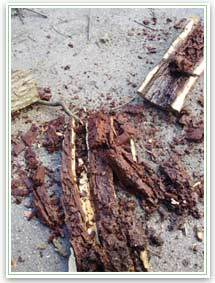 Where there is decay in the trunk the structural integrity of the wood will be compromised. There may not be enough strength to make the directional cut effective. Where there is not enough space to fell a tree in one go, or there are targets and obstacles that can not be removed then a tree can only be removed by dismantling it in sections. Where it is not possible to drop sections from the tree, they can be roped down by means of a pulley block attached to a suitable anchor point in the tree. Specialist lowering devices are used when sections are heavy and where control and security are nececessary. Equipment and planning of operations must be in accordance with LOLER 1998 - Lifting Operations and Lifting Equipment Regulations. 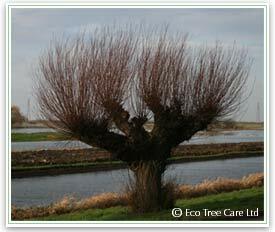 Pollards are trees that have numerous branches arising from the same height on the trunk. 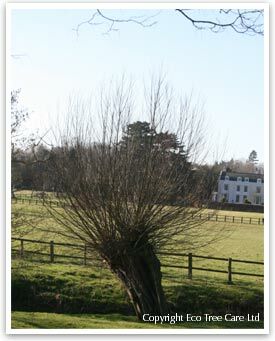 Pollarding is commenced when a tree is young generally after it has become established and has a stem diameter of between 25 and 50mm at the desired height. Usually 2 to 3 metres depending on the situation. 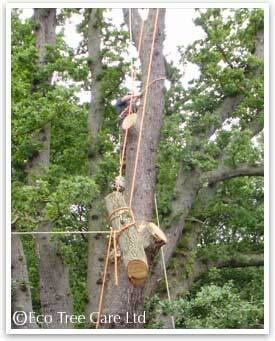 Pollarding trees is a method of maintaining trees at a certain height often in formal situations. Historically pollards were used to mark boundaries and culturally they were a method of feeding cattle. Fresh leafy growth was allowed to grow out of reach of the grazing animals and then cut and let fall to providing fresh animal feed as required. Depending on the species and the knowledge of how well they will respond to this treatment it may be that pollarding can be initiated upto a stem diameter of 200mm. If this is the case or if the species is particularly prone to dieback after heavy pruning, then lower branches should be retained and these can then undergo phased removal. Once pollards are initiated there ongoing management will always be to re-pollard. The reason for this is that the stems that re-grow will always have relatively weak unions with the trunk. While they are small and young there is little problem, but if allowed to grow they will eventually become more prone to splitting out. Some species are stronger than others. Coppicing is most notably a woodland management technique, but it can also be found and used in a tree surgery / amentity context as an effective tree management tool. 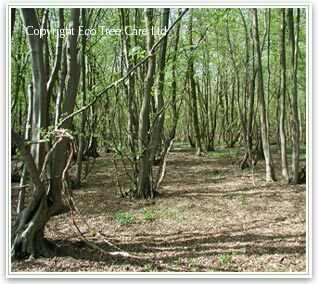 Coppicing is the repeated cutting of a tree down to near ground level on a regular cycle and allowed to regrow. The cut stump is referred to as a coppice stool. Traditionally this is a method of producing straight poles over and over again that can be used to make coppice products or as method of growing wood for fuel on a sustainable basis. The result is the development of a multi-stemmed tree. Like pollarding, once a coppice is initiated it muct be continued to managed in this way. The stems if allowed to grow too big, become 'overstood' and become more liable to fail at their union with the stool. Tree surgery operations have to be scheduled with regard to the season and with due care to the legal protection afforded to nesting birds and bats. Complete tree removal can be carried out at anytime of year, only it may not be possible due to nesting birds or the presence of bats. This is particularly so for densley growing species, such as conifers and trees with lots of ivy, and old trees with nest holes. Overall Reductions should not be carried out in early spring, just before bud burst and during flowering, or in early autumn, just before leaf fall. At these times the trees are in a growth process that renders them particulary weak to pruning. Reductions can be carried out during the winter or ideally summer, when the tree is in full growth and is better able to resopond to wounding. Crown thinning can be carried out at anytime of year, although it is better to avoid early spring, just before bud burst and during flowering, or in early autumn, just before leaf fall, particularly if it is a relatively heavy crown thin. Hedges - Hedge pruning and hedge reductions are frequently put on hold during the bird nesting season, in particular leylandii and laurel hedge reductions. Wild birds are legally protected and they love dense hedges. Wild bird nests are almost impossible to detect prior to work. For this reason it is better to schedule hedge pruning work outside nesting season. Pollarding is traditionally carried out in the winter months, as long as it is not left too late. Pollarding in early spring when the buds are starting to swell, or after the leaves have started to appear, is particulaly detrimental to the trees health. 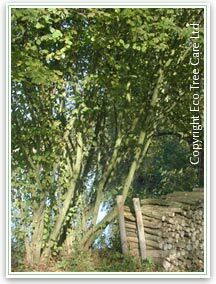 Coppicing, like pollarding, is also traditionally carried out in the winter months, as long as it is not left too late. Pollarding in early spring when the buds are starting to swell, or after the leaves have started to appear, is particulaly detrimental to the trees health. Prunus Species - Trees of the Rosaceae family, particularly the genus Prunus, are very susceptible to a widespread and common fungal disease known as Silver leaf (Chondrostereum purpureum). The fungal spores enter through wounds including pruning cuts. Once established (in Prunus) it proves to be almost always fatal. 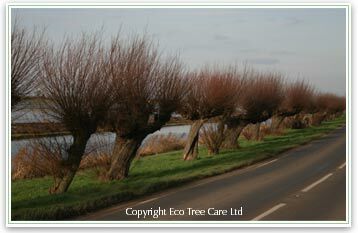 The time of year that pruning is carried out is a very important factor preventing this disease and dramatically reduces the risk. They should be pruned in the summer (usually between June and August) when there is little risk of infection. Weather does also have an effect on what can take place. 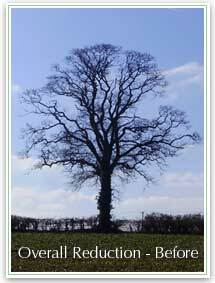 During heavy periods of wet weather on clay soils, the soil can become compacted in areas around retained trees. Where possible tree work should be rescheduled until conditions improve. Also for health and safety reasons it could be dangerous to climb beech trees in very cold winter weather as the branches can be brittle. Our range extends out from ... for approximately 20 miles.